It gives us great pleasure in presenting our client William Hinson, author of a most fascinating book titled “Discovering Ancient Giants”. Available on Amazon.com and shortly listed at Barnes & Noble. To be released in paperback and available from all good book retailers in your area. Publisher:Black Books Plus (Seaburn Publishing & Distribution Group). William Ashley Hinson was born in Plymouth, North Carolina and grew up in the Blue Ridge Mountains of Virginia and the Piedmont area of North Carolina. He has lived in the Murrells Inlet area of South Carolina since 2004 with his wife and three children. He has only recently moved to Charleston, South Carolina where he is supporting his oldest son as he attends the College of Charleston. William received my Bachelor’s Degree from High Point University, and has taught history in the public schools for ten years. He has published numerous family history books over the years. Discovering Ancient Giants is a closer examination of the evidence for the existence of ancient giants in our remote past. The author has put together ten years of research in the subject of ancient giants in one really exciting book. Hard evidence of ancient human giants has never supported this theory. Now, the amount of evidence is pointing to the realization that human giants did in an earlier time exist. This book is a non- fictional approach to this taboo subject. This book is a great source of knowledge of evidence supporting the existence of human giants in our past history. Is there any evidence that human giants existed in our remote past? Modern day archaeology and anthropology have nearly sealed the door on our imaginations, broadly interpreting the North American past as devoid of anything unusual in the way of great cultures characterized by a people of unusual demeanor. The great interloper of ancient burial grounds, the nineteenth century Smithsonian Institution, created a one-way portal, through which uncounted bones have been placed. This door and the contents of its vault are virtually sealed off to any but government officials. Among these bones may lay answers not even sought by these officials concerning the deep past. belonging to an earlier time, possessing a different fate or destiny from the latter. Evidence for the occupation of this country before the appearance of the red man is to be found in many states throughout this country, as well as throughout the world. In removing the gravel bluffs, which are numerous and deep, for the construction and repair of roads, and in excavating cellars, hundreds of human skeletons, some of them of giant form, have been found. A female citizen of Marion County estimates that there were about as many human skeletons in the Knolls of Marion County, Ohio as there are white inhabitants at present! (The History of Marion County, Ohio, compiled from past accounts, published in 1883). Amazing finds were also made in California about 1810 and in Montana in 1924. One was that of a six-toed giant, the other was the skull of a man found 130 feet deep in a lava-covered mine. A human molar embedded in an Eocen coal measure was found in November 1926 in No. 3 Eagle Coal Mine at Bear-creek, Montana, and in strata anywhere between thirty and seventy-five million years old. An amazing skull—of a giant man with double rows of teeth all and massive jaws was found on Santa Rosa Island in the Santa Barbara Channel, California. It has a singular tie-in with the statement in the old Babylonian Talmud, called the Berakthoth, that the giants before the Great Deludge had double rows of teeth! Many of these discoveries were made early in the nineteenth centuryand in one case where a giant man’s skeleton was exhumed by soldiers at Lampock Rancho, California, the Roman Catholic padre ordered the skeleton to be reburied because the local folk swore it was the skeleton of a god. These remains were often discovered accompanied by cemented gravel six feet thick lying under volcanic ash—the sign of an ancient cataclysm—ancient metal skillets, beautifully made plummets of syenite, strange inscriptions on ancient artifacts, sea shells lined on the inside with gold and worked with unknown inscriptions, carved blocks of porphyry engraved with hieroglyphs, hieroglyphs on hard rocks covered with iron scale, queer slate tubes and cylinders, and well-made pestles and mortars. All of these, of course, are evidence of ancient civilizations. In 1947, a newspaper account of someone finding thirty-two caves with remains of what appeared to be 8 to 9 ft. tall giant human skeletons. These caves bordered Arizona, California and Nevada. The giant skeletons were still wearing what appeared to be skins from some type of animal. The clothes resembled that of pre-historic times. This find was first discovered years earlier by a man who then reported the find to the Smithsonian. The remains were stolen after that conversation and a cover up seemed evident. The Smithsonian was also named for other cover-ups through the years when others reported their own findings. Was it possible that these findings were scooped up by the Smithsonian or did they report the findings to another organization that wanted to keep this information secret? Were there giant people walking the earth many years ago? If so, what made them so big? Why did the giant population disappear from the earth? Why are the accounts of giant people kept relatively quiet? Why is there no word from anyone about the possibly of giant people that once may have walked the earth? Mr Hinson has demonstrated throughout this book a masterly and in depth understanding of the subject. Not only are there numerous authenticated eyewitness and newspaper excerpts painstakingly researched from all around the world, but a wealth of fascinating pictorial evidence that will keep readers coming back to this book time and time again. Anyone who still stubbornly clings to the naive belief that modern humanity was only on this earth for less than 10,000 years will have their root beliefs shaken to the core. Shame on the Smithsonian Institute and other such places for denying the world the truth! I for one now view many of the old fairy tales about giants and ogres with a whole new respect, as it is now all too apparent that such stories were based on ancient fact. It is also worthy of note that no matter in what culture giant stories appear around the world, they are almost always vicious, cannibalistic bully boys. This certainly gives credence to their mention in the Koran, the Talmud and the Bible, not to mention numerous Asian/North American tales as well of the giant ‘scourge’ that once plagued the earth and the Great Flood God sent that severely curtailed their number. As Mr Hinson also points out in his work, there have been many well documented examples of giant creatures in the past, whose much smaller descendants are still among us today. Why, therefore, is it unrealistic to assume that at some time humans were also at least twice the size of modern man? This book is really awesome! I’ve always been curious about giants and the author did a great job at collecting a variety of evidence that ancient giants did exist! 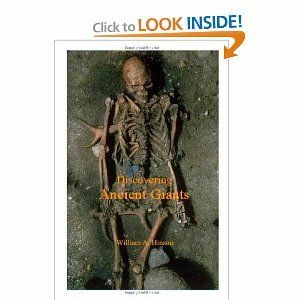 I recommend this to anyone that ever wondered about the origins and evidence that giants used to be among us.